Okay, so by now you have found your favorite hidden collecting spot for sea glass. The next steps can be tedious for some, but the process is an important one. Just stop and think about the sea glass that you have picked up. It really is trash no matter how we think of it. If you are lucky enough you have found a dumping ground, or even a deserted beach where people run their dogs, or any beach for that matter the sea glass has had an unknown journey. So, with that in mind it is in need of a good disinfecting before you go any further. We choose to use a bucket filled with white vinegar and a touch of water. Let the sea glass soak a minimum of 2 hours and then rinse with plain water. The white vinegar is an inexpensive way to clean the sea glass naturally without any harsh detergents, and it works. You can find it in hardware stores in a gallon size or at your local grocery store. For any tar or stains that I find on the sea glass I use Goo gone, a staple in our home it is a wonder product that you can also find in your local hardware store. From there I sort right from the bucket so the glass is still wet when I begin the process. I sort onto a white towel to allow the sea glass to dry. I use white because now the color sorting will begin and the colors will show through on a white background. We are fortunate to live in a place that has an abundance of sunshine all year long. You really need natural light to sort your colors properly, so find a place next to a window if you cannot sort outside. This is where we all find our own comfort zone, as their is really no specific way to sort. I personally start by colors, sorting them into piles, but pulling any unusual pieces out that have writing on them or that are really unusual. Keep in mind I am a designer so I know that I will be using these pieces for my jewelry. So sizing will come next, pendant sizes, earring sizes and so on. Have you ever noticed how many triangles shapes there are? These have to be matched for earrings a very tedious process similar to doing a jig saw puzzle. From there I keep a large board with the matched pieces that goes on to the next process of drilling. We will discuss this process further down the road in another how to blog. At this point you may want to fill your favorite bowl or jar with your sea glass and just enjoy it! For some, the frosted dehydration look of the sea glass is perfect. For others they may want to see a shinier finish. Try applying baby oil or baby lotion to your sea glass and it will leave the glass with a shiny finish. 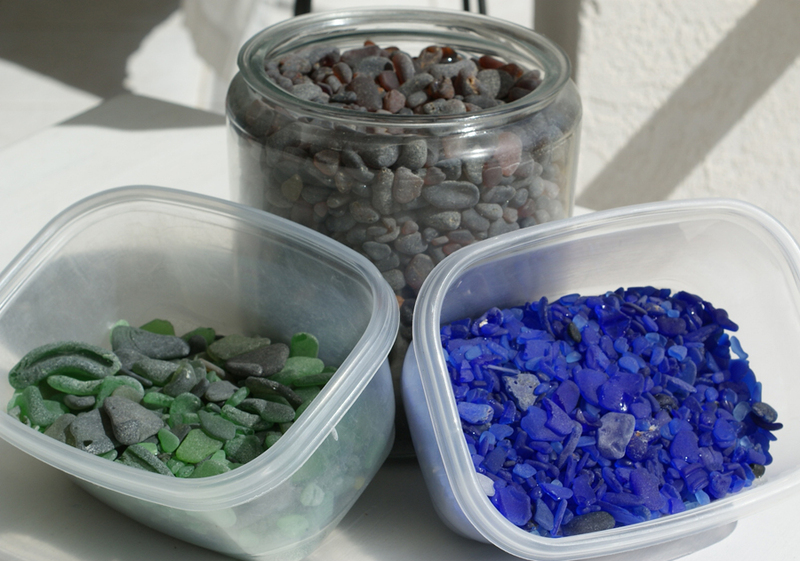 Our next how to blog will be determining the value of sea glass.